These tall aristocratic beauties have been hybridized to produce healthier and bigger flowers and are now available in almost any modern color imagineable. Extremely popular with florists these classic cutflowers (pick them when the bottom flower is fully open) are very easy to grow. They will add color, height and stature to the back of your borders. 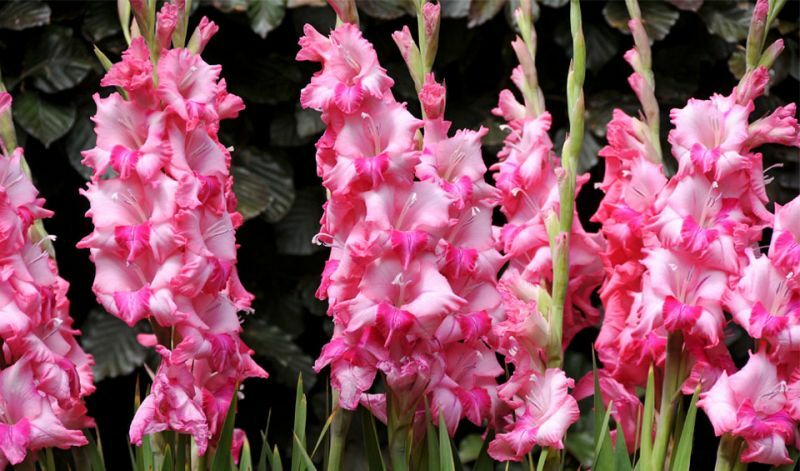 The blooms vary in size, depending on the variety, from 2-8" / 5-20 cm across when fully open. 'Fidelio' (lavender-pink), 'Green Star' (lime green), 'Nova Lux' (yellow), 'Oscar' (maroon), 'Peter Pears' (salmon), 'Plum Tart' (purple), 'Priscilla' (cream, pink edge), 'Traderhorn' (red, white blotch) and 'White Prosperity' (white).